Apply for auto financing at our Artioli finance center today. Few people can afford to buy a car, whether new or used, without some kind of a loan. While you can get a car loan through your bank as well as through other lenders, you can also apply for financing directly through us via our auto finance center. In fact, in many cases, applying for financing through our finance center may be a better idea. 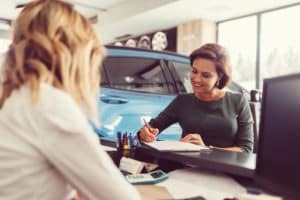 What many people don’t realize is that car dealerships tend to have access to a wider variety of financing options than they do. This is true in the case of our auto finance center as well. Whereas you may only be able to find one or two potential lenders, we can help you find several different loan options with potentially better terms, such as lower interest rates or lower down payments as well as potentially flexible payment periods, all of which can result in lower monthly payments and a lower overall cost. We can help you to obtain the financing that you need to purchase any of our vehicles here at Artioli Chrysler Dodge RAM, including our wide selection of both new and used cars, trucks and SUVs. Applying for financing through our auto finance center is a lot easier than you might think. In fact, we approve financing for customers no matter what their credit might look like. We have approved customers with good credit, bad credit and no credit before. In fact, we have even approved financing for customers with past bankruptcies to their name! Filling out our financing application is easy and will only take you a few minutes to do. Our financing application form will require to fill out basic personal information, such as your name, address, email, date of birth and social security number (don’t worry, we’ve taken security measures to ensure that it’s safe to provide your personal information through our site). You’ll have to fill out some basic employment and income information as well. Last, but not least, you’ll be asked to provide information about the vehicle you’re purchasing. Once you’ve filled all of this out and agreed to the terms and conditions – you’re done! All that’s left is to submit the application. If you’re interested in purchasing a vehicle from us and need a car loan, then be sure to consider financing your vehicle through us. For more information about our financing options, be sure to contact our auto finance center at Artioli Chrysler Dodge RAM to speak to one of our finance experts today.